A City in a City of apartment life built by the Metropolitan Life Insurance Company of New York. In the mid-1980s my brand-new girlfriend told me she worked in a bakery part-time. "It's in Parkmerced." "No, Parkmerced. You know, the big towers?" Of course I knew Parkmerced. My main impression of it being the last bit of San Francisco real estate you passed on 19th Avenue before you hit the freeway. Usually my parents and I were on our way to Serramonte to buy dress shoes. "There's a bakery there?" I asked again. The first time I tried to find the bakery (and pick up brand-new girlfriend) I got lost. From the front entrance on 19th Avenue I entered a labyrinth of pie-shaped blocks. Each vista of neo-colonial duplexes and green swards looked just the same to me, and I didn't pass another living person in ten minutes of wandering. The towers, my landmarks once I got out of earshot of 19th Avenue, didn't help much either, all being painted the same greenish-beige (if there is such a color). The fog began its three o'clock commute from the ocean, and great cotton balls of the stuff rolled through me as I sloshed across a huge, gopher-holed meadow. Eventually I stumbled on the bakery, a sad little shop in a strip close to where I started. The other storefronts were vacant or closed. Brand-new girlfriend said they received maybe ten customers a day, mostly seniors. She was laid off soon after. In the 1980s Parkmerced had the whiff of a failed experiment, an urban plan past its time and purpose. Like a defunct army base or an old corner of Disney's Tomorrowland (maybe over near the submarine ride? ), it was due for a makeover. One percent of San Franciscans lived there, but it just felt like a place for San Francisco State students to park their cars. But Parkmerced has changed. In the 21st Century it's called "The Villas Parkmerced". Cheerful palm trees, a fountain, and a brightly-painted gateway office all beckon to the traffic. The banners, flags, public art in the form of a fiberglass heart make one want to at least take a peek in the place. The current management touts the amenities of a club room, small movie theatre, fitness center, Montessori school, and community garden. Parkmerced was the idea of the Metropolitan Life Insurance Company of New York. The company had fought through the Depression with traditional investment ideas and decided rental housing might provide a more stable cash flow over time. In the Bronx they launched "Parkchester" and in Los Angeles "Park LaBrea". In San Francisco, they purchased almost 200 acres of land from the old Spring Valley Water Company in 1941 and named their new project after the lake next door. Met Life hired the architectural firm of Leonard Schultze and Associates, who brought in the now-famous landscape architect Thomas Dolliver Church. Schultze and Church designed the pie-shaped blocks with apartments grouped around patios and public spaces. The idea of creating housing in a park atmosphere, of designing a development with a creative geometric design, and providing "commons" for the residents had been successfully put into practice for decades. 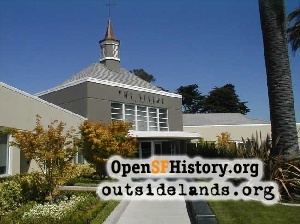 From exclusive Presidio Terrace to plebeian Miraloma Park, western San Francisco had been the proving ground for many of these "City Beautiful" guidelines. What made Parkmerced different was the beneficiaries would be renters. Met Life broke ground in 1941. Scarcely had the work begun when the United States entered World War II, and, as Architect and Engineer remarked "the project [ran] the gamut of ups and downs." 7 Rationing of materials forced the builders to drop steel for wood frame (and some reinforced concrete) construction. About a third of the apartments were cut from the plan. Met Life did its best to appeal for priority in obtaining materials, claiming their housing was essential for the tides of war workers arriving in the Bay Area, and eventually the influx of returning veterans. Despite all the difficulties, the first occupants moved into their garden apartments on Font Boulevard in early 1944. Rents varied from $52 to $84.50 a month. In a review for Architect and Engineer, landscape architect Mark Daniels praised the way the apartments had facing courtyards that created community space. He noted that as a balance the front of each domicile had private terraces where the tenants could "serve a highball (if they dare) without running the risk of having their generosity interpreted as a general invitation." Maybe these courtyards were once the scene of great 1950s barbecues and badminton games, but I've never seen them used as more than paths to and from the carports. As for highballs on the front "terraces"... well, it's a nice idea. Parkmerced made the effort to design for community interaction, but perhaps the fog and general insular nature of modern Americans worked against its flowering. After fighting and struggling for three years to get the garden apartments built, Parkmerced benefited from the post-WWII housing boom, and jumped eagerly into a second phase of construction. Circular sofas still decorate elevator lobbies, but the attending doormen of the 1950s are gone. The apartments still feature parquet floors and kitchens with galvanized metal counters and cupboards, but the underground garage no longer has its working service station. In 1941, the year Met Life began the Parkmerced project, Paul Trafficante decided he had to get away from the organized crime violence of his native New York City. 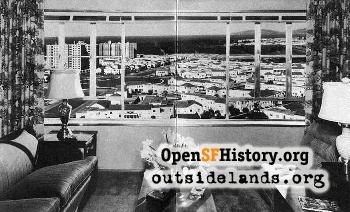 He first took off for Alaska, and after World War II joined the thousands who decided to make San Francisco a new home. He eventually rented an apartment in Parkmerced, and saw that in a rapidly diversified city the enormous complex was overwhelmingly white. Minorities were actively discouraged, their applications delayed, and waiting lists for apartments were manipulated to keep them out. Trafficante, a Caucasian, sued Met Life in the late 1960s, claiming that because of its exclusionary rental practices he "lost the social benefits of living in an integrated community, missed business and professional advantages that would have accrued from living with members of minority groups, and suffered from being 'stigmatized' as a resident of a 'white ghetto'." In the middle of the Trafficante suit, Metropolitan Life sold Parkmerced, and a series of ownership changes came in the next decade. Stability of a sort came in the mid-1980s when Leona Helmsley, a real estate investor who was nicknamed the "Queen of Mean" in New York, bought Parkmerced. The current owners advertise "The Villas" aggressively, courting students and young families. They sponsor good causes such as Friends of the Library events, and concerts in Stern Grove. They've also applied to build new housing on the property's southern border, this time units for sale. San Francisco has often anguished over how to stop the exodus of the middle class and the families. Parkmerced's founder Frederick Ecker planned a place of "simplicity, utility and beauty" to keep moderate-income renters in town. Today, the mayor and the supervisors blame housing prices for the new race for the distant suburbs. Rather than moderate rents, all seem to think more $800,000 housing on the market is the answer. And San Francisco's marketplace richly rewards anyone who can put out a "For Sale" sign. So Villas Parkmerced is creating more housing. Whether a moderate-income family like my own will be able to buy isn't known at this point. My great thanks to Inge Horton, whose report on Parkmerced and Thomas Dolliver Church for DOCOMOMO (Document and Conservation of the Modern Movement) was invaluable. 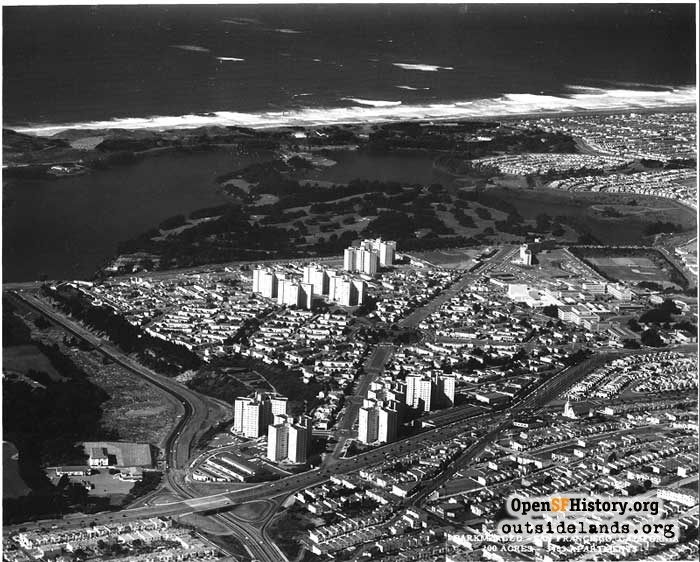 Images: 1) The Villa Parkmerced administration building, August 2004 (WNP photo); 2) Aerial of Parkmerced, late 1950s (Moulin Studios photo, courtesy of The Villas Parkmerced); 3) View from a tower living rooom, 1950s. Taken from a brochure in WNP files. 1. "Simplicity, Utility, Beauty Aims of Housing Project", San Francisco Chronicle, January 26, 1941, pg. 9, col. 2. 2. "Housing Project Planned for S.F. ", San Francisco Chronicle, January 5, 1941, pg. 1, col. 2 and "Park Merced Will Be Model City of Future", San Francisco Chronicle, February 2, 1941, pg. 7, col. 1. 3. San Francisco Chronicle, January 26, 1941, pg. 9, col. 2. 4. Since some of the Anza expedition were already commemorated on San Francisco streets ---Anza, Cabrillo, Castro, etc.---Met Life used many maiden names of the wives who came with expedition. For example, Serrano Drive honors de Anza's wife, Dona Ana Regina Serrano. 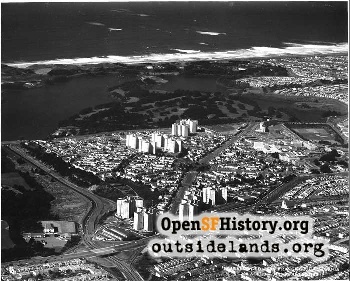 See paper by William F. Benedict, The Anza Expedition of 1775-76 to Colonize San Francisco, Used as a Theme for the Naming of Thoroughfares..., August 18, 1941. Copy in WNP files. 5. Landscape architect Mark Daniels complained about the name: "[W]e do not think of a 'Meadow' as a place to play games, but rather as a place for sheep and kind-faced cows to graze." Architect and Engineer, Vol. 158, September 1944, pg. 14-22. 6. "Park Merced Will Be Model City of Future", San Francisco Chronicle, February 2, 1941, pg. 7, col. 1. 7. "Parkmerced Housing Project, Architect and Engineer, Vol. 154, September 1943, pg. 43. 8. Daniels, Mark, "Parkmerced - San Francisco's First All-Rental Community Housing Project, Architect and Engineer, Vol. 158, September 1944, pg. 14-22. 9. Architect and Engineer, Vol. 176, January 1949, pg. 46-7 and "Parkmerced Apartment Buildings to Open Jan 1. ", San Francisco Examiner, August 4, 1950, pg. 34, col. 1. 10. Voigt, George, "The New Patterns in S.F. Housing", San Francisco Chronicle, January 2, 1949, pg 1L, col. 1. 11. U.S. Supreme Court, Trafficante et al. v. Metropolitan Life Insurance Co. et al., No. 71-708. Decision December 7, 1972. 12. Sullivan, Kathleen, "Obituary: Paul Trafficante - he won key integration suit", San Francisco Chronicle, October 2, 2001. 13. Shepard, Susan, In the Neighborhoods, Chronicle Books, San Francisco, 1981. Shepard was generally disparaging of the southwest part of town. Contribute your own stories about western neighborhoods places!